Visible clothing worn on the line should not be made of any inappropriate fabric. Unseen seams may be machine stitched, but anything that is visible must be stitched by hand with linen thread. England was known for both the quality and the quantity of its wool. As a result, it was not only the most accessible fabric but the least expensive, and it was used for clothing for all classes. This is not to say that any wool available today is correct for the reconstruction of pre-Conquest clothing. 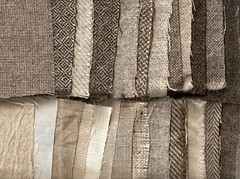 While it is not strictly necessary to make certain that the fabric is made from the wool of the Soay Sheep (a heritage breed probably grown by the Anglo-Saxons), you should try to concentrate on the following weaves: twill, herringbone 2/2 twill, diamond (or broken-diamond) twill and herringbone twill, worsted twill, cross twill, four-shed, tabby, houndstooth. These weaves have been found in graves during the era. The fine-ness of the weaves determines the value of the cloth, so you should not use a very fine weave to make a piece pf lower-class clothing. For examples of weaves and advice on what these different weaves are, do not hesitate to ask the Authenticity Officer and other veteran members! Linen made from flax of nettle plants were commonly used. Although linen would probably not have been used for lower-class clothes, we realize that some people are allergic to wool, so exceptions can be made with permission from the AO. Linen is most commonly a tabby weave. This is a combination of wool and linen threads. It was known during the period but was not apparently often used. Before using linsey-wolsey for any garment, check with their AO. Silk was used by the wealthiest in our period. All-silk garments were restricted to the most wealthy; silk trims were used by the well-off. Silk had to be imported from the Middle east and should not be used in the construction of clothing for Micel Folcland at this time, since the clothing would indicate a class of person wealthier than those active in the group now. Hemp was known and used, but ironically it was probably not used for cloth. Any hemp found has been rope and cord. Avoid the use of hemp to make garments without the prior permission of the AO, and be ready to show provenance for its use! Leather was used for many purposes, and there is literary evidence for its use as breeches during the Anglo-Saxon era. However, its use for cloaks and hoods was discontinued during the Iron Age. Do not use black leather. Although black leather is mentioned in period sources, it was probably not the deep black we know today. In any case, before using leather for a garment, check with the AO. Actually, a blend of fabrics may be used if they look natural, but only f they look natural! Before you use such fabric for anything, check with the AO! However, for safety reasons, clothing made of such fabric should not be worn around open flames. Aidan Campbell, Regia in England, coordinated a weaving project Fall 2008/Spring 2009. In the interest of "less posh, more common" he coordinated hand spinners and weavers to make cloth of various weaves & weights accurate to our era for members to make clothes in natural (un-dyed) colors so, at the various shows Regia was contracted to do, there would be going toward a more accurate portrayal. Here is a scan of swatches from the project.